"It's hard, like getting blood out of a stone, trying to get those points and get housed." Barry's dad, also called Barry, told BBC News NI. A spokesman for the Housing Executive said it hopes to provide the pair with a permanent home soon. 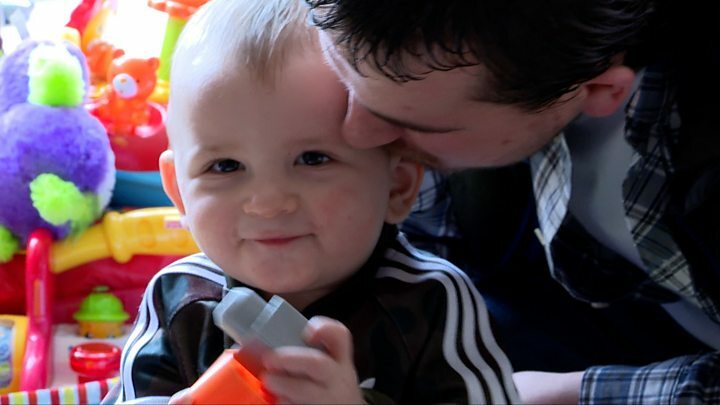 Mr Flynn had a bedsit of his own before his son was born, but because he has learning difficulties, he was required to move into an assessment centre for 17 weeks at the start of his son's life. He then had to give the bedsit up as it was deemed not suitable for a baby. He is no longer with Barry's mum. So after completing the assessment, the pair had no home to go back to. That's when they were moved into the hostel they are currently living in. "We've been living here pretty much all of wee Barry's life," said Mr Flynn. "The way things are going I can see us being here for another year." As of January 2019, there were 2,431 homeless children in temporary accommodation in Northern Ireland. Like any father, Mr Flynn, 27, is keen for his son to grow up with the freedom of his own home. "I wish we had a place with a back garden, they stop people coming into the hostels to visit and stuff and you can't really do your own thing," he said. "All this is doing is holding us back." Mr Flynn confessed he never imagined that this was how things would end up when he was with his son's mum, but he said it was a "good experience" raising his son. He is positive about the hostel he is staying in now, despite normally being the only man living there. "What was difficult about Barry's situation was that he had a house and had to give it up," said Jenny Potter, community development manager with Now Group, a charity which provides support to people with learning difficulties. "There appears to be a housing issue right across Belfast, but surprisingly, for families with very young children as well. "Early years are so important in a child's life, they need stability and they need appropriate accommodation and while there are fantastic facilities like this one, there should be opportunities for families to get permanent housing and the fact that a single dad with a one-year-old is not the top priority on the housing list is quite shocking. "And particularly when Barry (senior) has some additional support needs, you would think he would be getting more points and be able to get a house in a much, much shorter amount of time than waiting well over a year with no end in sight." A Housing Executive spokesman said Mr Flynn had asked to be housed in an area of high housing demand and low housing turnover. He said that in the last five years there had been an increased number of people presenting and being accepted as homeless or seeking to be re-housed. "Some of the main reasons for people presenting to us include housing that is no longer suitable for a person's needs, loss of rental accommodation or relationship breakdown," he said. "Our priority is to find good housing solutions in all cases and we work with a range of statutory and voluntary agencies to address every individual's needs. "We are increasingly seeing more and more vulnerable people present as homeless and everyone who presents as homeless, who is in priority need of housing, will be offered temporary accommodation."